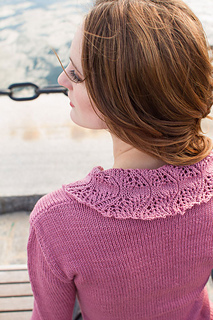 I had a rough idea for a pullover with a lace cowl for quite a while when I got the call from Louet. The idea solidified as I dug through countless stitch dictionaries looking for just the right stitch for the cowl. The body of the sweater and sleeves would be a simple stockinette to properly showcase the lace, and the lovely and easy-to-knit Japanese feather stitch, which has been haunting me for quite some time, would be used for the cowl. Normally the body of a sweater is knit with the largest needles. In this case, the largest needles and smallest yarn are reserved for the lace cowl, the smallest needles are used for the ribbing, and the medium-sized needles are used for gauge and to knit the body and sleeves of the sweater. Pieces are knit separately from the hem up, shoulders are seamed, and cowl is knit onto the sweater in the round. Then sleeves are sewn on, and sides are seamed. Stitch pattern: Charted and written.